What do you do with the entire pint of berries that your picky toddler won’t eat? Make muffins! If you don’t have a mini muffin pan, I highly suggest you purchase one. The muffins are the perfect size for those little toddler hands. Plus, you won’t feel bad when you eat 3 of them. Preheat oven to 375 degrees. Mash bananas in a large mixing bowl. Add sugar, egg, butter, and berries. Combine dry ingredients and gently stir into banana mixture. Pour into well-greased muffin tins or use muffin cups. The gimmicky gadgets that are As Seen on TV often come with a promise that seems to good to be true. I don’t think I’ve ever bought one of those items or even been in one of the As Seen on TV stores, but I have been intrigued. For Christmas this year, I asked for one of these items and my mind has been BLOWN since I received it. The gimmicky gadget known as The Veggetti inspired me to tell you all about it and a few other things that have made my health journey a little easier. So, I won’t keep you waiting any longer, here are my favorite kitchen gadgets. During my pregnancy, all I craved was spaghetti which ultimately helped me gain over 50lbs. Had I purchased this little gem during those 9 months, I may have been able to save a few of those pounds….maybe? It has allowed this pasta lover to enjoy pasta dishes again. There are several versions of spiralizers, but this one is affordable and easy to store. It turns vegetables into noodles, so you can enjoy pasta dishes without the heavy, refined carbs. I’ve experimented with zucchini and sweet potatoes, but have my eye on making a cucumber noodle pasta soon! I remember when this “lean, mean, fat-reducing machine” came on the market in the 90s – it was all the rage! Now, a couple of decades later, the rage has died down, but the grill is still as awesome as it once was. It’s not only convenient by allowing the ability to quickly grill indoors, but provides the benefit of reducing the fat out of certain meats. The product is designed to heat the top and bottom surfaces of the food, eliminating the need to flip it. Each heating surface is grooved to reduce contact area, and covered in a non-stick coating. The lower heating surface is slanted to allow melted fat and other fluids to drain through the grooves into a separate drip tray, which shows the amount removed from the food. It’s now offered in individual sizes and larger sizes for multiple servings. Broccoli is one of the most common side dishes in our home. Shamefully, I must confess that it typically comes straight out of the freezer and into the microwave with a little lemon pepper shaken on top. I can only imagine how many precious nutrients are stripped away in the name of convenience. Recently, I pulled out my steam basket that I have had for years instead of my usual microwave technique and it was SO much better. 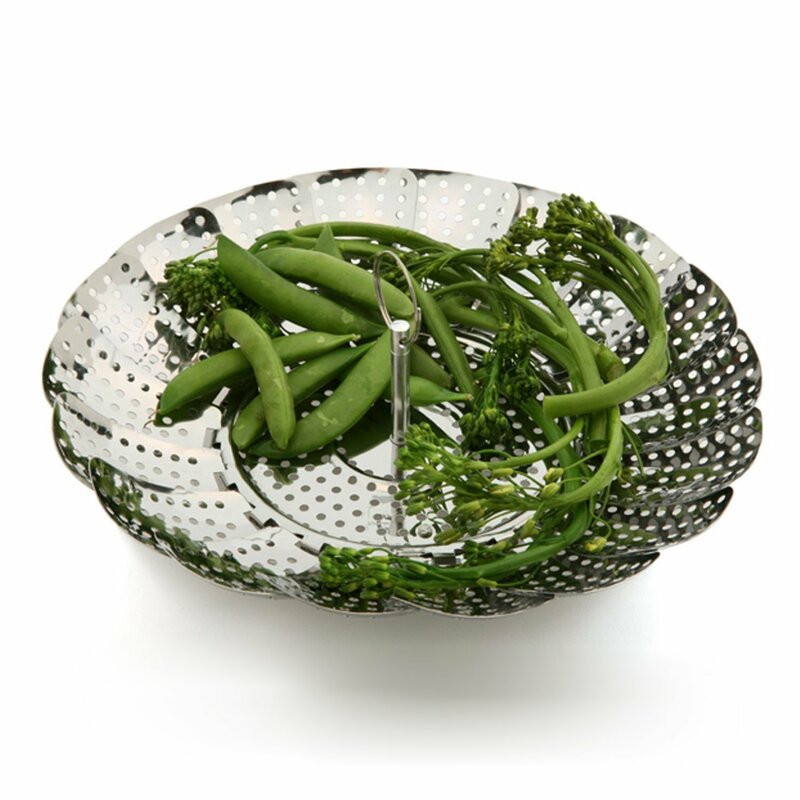 The steam basket fits in almost any size sauce pan and preserves the nutrients and flavor of vegetables. This was one of the many items that we randomly added to our wedding registry because it looked cool. After the first use, I was hooked. As a lifelong Pam user, I had come to terms with the fact that it is filled with unnecessary chemicals and that I needed to find another option. The Misto (and coconut oil) was that option. It is a reusable oil spray and mister bottle that gives you the convenience and health benefits of an aerosol sprayer in a more economical and environmentally-friendly form. I’ve only used it with olive oil, but it can be filled with any kind of oils, vinegar, and even salad dressings. 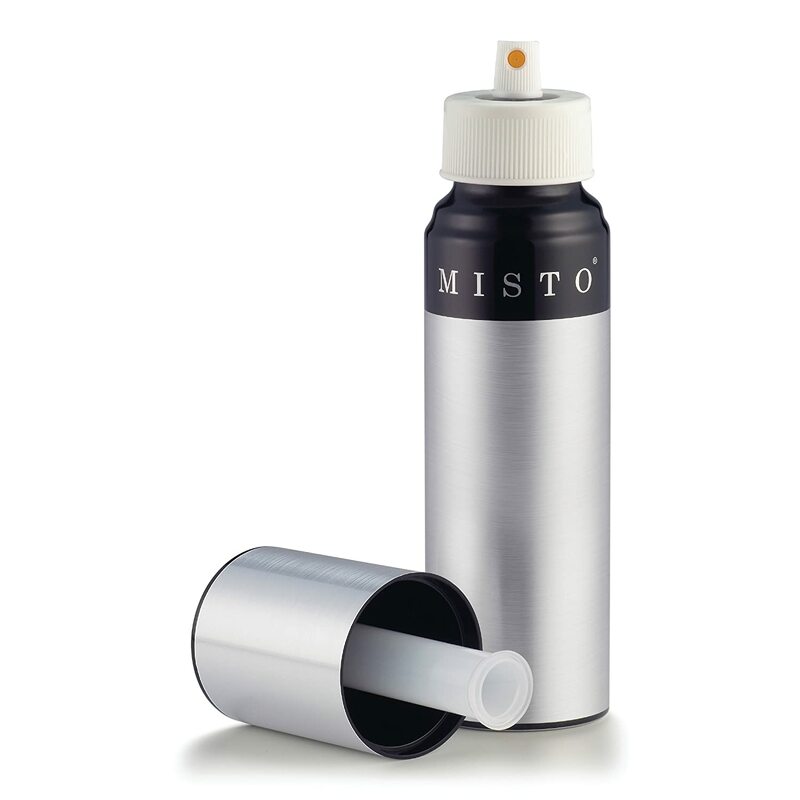 The Misto produces an even, pure mist, so you use less oil when preparing foods. You’ll eat healthier and save money – a win all around! Any excuse to use my beautiful Dutch Oven, I’m all for it! On Monday’s we are limited to cooking time, so I always look for something quick or a crockpot meal. This one takes less than 30 minutes to prepare and cook, so it is perfect for a quick weeknight meal. A bonus: it really can all be done in one pot, so less mess to clean up! Add coconut oil to pot (a dutch oven works best) and set the heat to medium, then add chorizo. Stir the chorizo until it looks slightly seared. Add your onion, salt, and cayenne and stir well. Once onions are tender, add coconut milk, chicken broth and water. Raise heat to medium high until the liquid reaches a simmer. 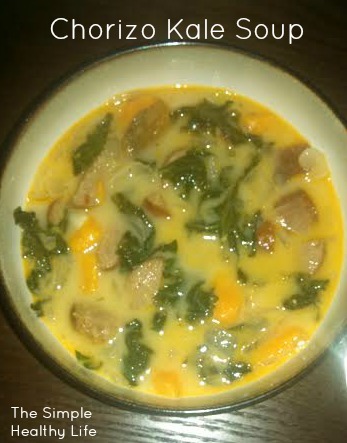 Add the kale and stir into soup. Lower heat to low, cover, and simmer for 20 minutes. I always struggle with side dishes and get stuck in the same rut of sweet potatoes or broccoli. I always forget that some of the best side dishes are just roasted vegetables. Cauliflower is often overlooked by broccoli in the cruciferous section. However, its delicious when roasted, steamed, or mashed and can be a great snack due to its crunchiness. It is high in Vitamin C (ranks up there with citrus fruits), an antioxidant that combats cancer and infections. Its also notable for fiber, folic acid, and potassium. Its phytochemicals make it a natural cancer fighter because they are said to stimulate enzymes that block cancer growth. Soooo, this recipe is a WIN! Add cauliflower to a large bowl and drizzle with olive oil. 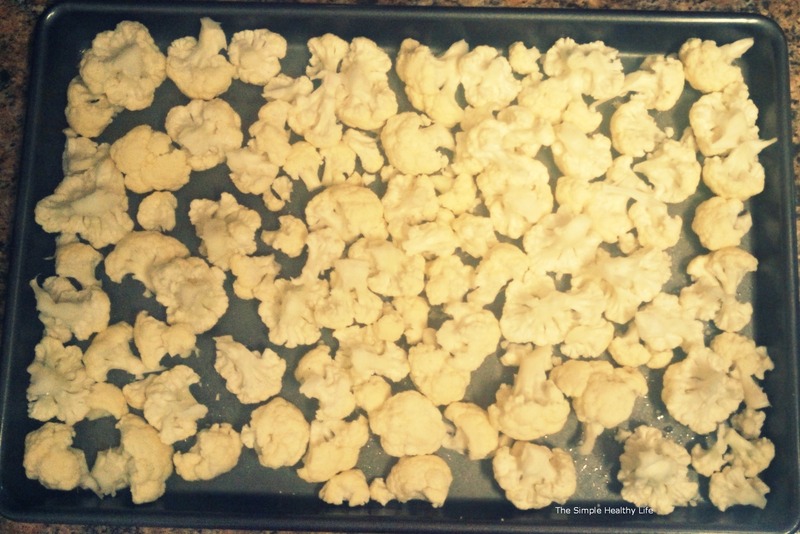 Toss to make sure all florets are covered and put florets on a large baking sheet. Sprinkle with sea salt and parmesan. *This is optional, but you can use any seasoning or addition that you prefer. If you asked me what my favorite dish from childhood was I would say, “meatloaf.” There’s nothing better than warm meatloaf beside mashed potatoes and peas. 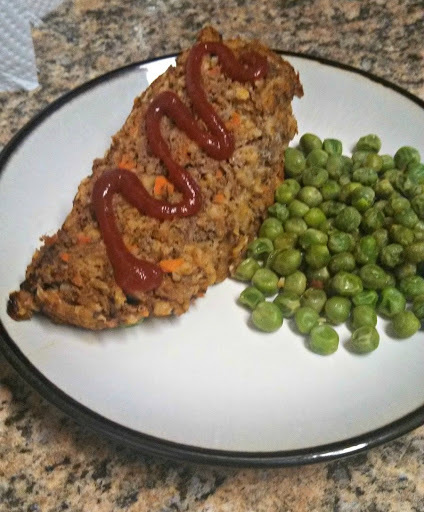 While I’m sure that my mom’s meatloaf was not particularly healthy, I’ve tried to recreate it in a more healthier way. These days, I pair it with peas and occasionally some mashed cauliflower. Mix all ingredients in a large mixing bowl with both hand…get dirty! Form into a loaf shape and place in greased loaf pan. Bake at 350 degrees for 1 hour. Top with ketchup and enjoy! True story, I’ve never made pesto before! I bought a bunch of fresh pesto from Trader Joe’s and really didn’t know what to do with it. 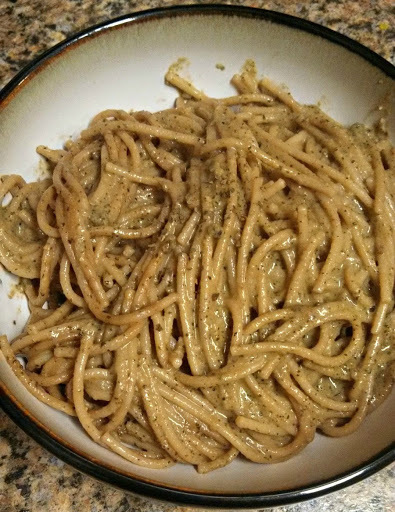 I quickly figured it out….Sunflower Seed Pesto. It will change your life. I made it into a pasta (not Paleo, but so good), but you can also use it as a spread on wraps, sandwiches, pizza, you name it! Place basil, sunflower seeds, EVOO, Parmesan, butter, and garlic in the food processor and process to a puree (pulse for 30 seconds, then scrape sides, repeat). Store pesto in a sealed container for up to 2 weeks. To use pesto in pasta: Cook 1 pound of pasta in salted water. When pasta is cooked, combine 3/4 cup pesto with 2/3 cup hot pasta water in a large bowl. Drain pasta and add to the bowl. Toss to combine. Add salt, pepper, and other spices to taste (I added lots of red pepper and extra garlic). Egg salad is great to throw on a wrap, on crackers, or a top a salad. Yesterday, I was working from home and feeling those lunch time hunger pains when I looked in my fridge and found only a few things that were worth eating for lunch. Eggs and avocados stood out. 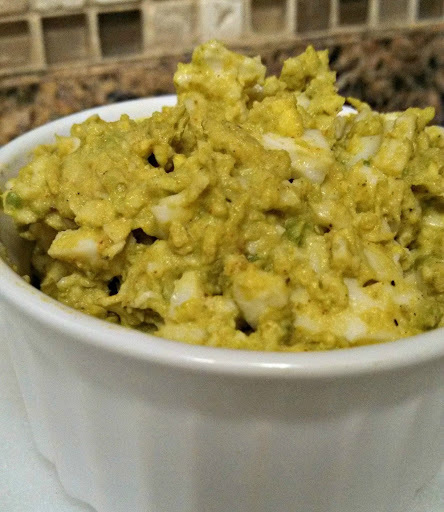 So, I threw together this Curried Avocado Egg Salad. I ate it straight with a fork and a few gluten-free crackers, but you can eat it however you like! Mix all ingredients together in a bowl and mash with a fork until well combined. Put it on a wrap, salad, or gluten-free crackers! Both Hank and I have a huge sweet tooth each night after dinner. It isn’t uncommon for us to search the fridge, freezer, or pantry in a panic to find “something sweet” for dessert. We usually end up going out to find ice cream. 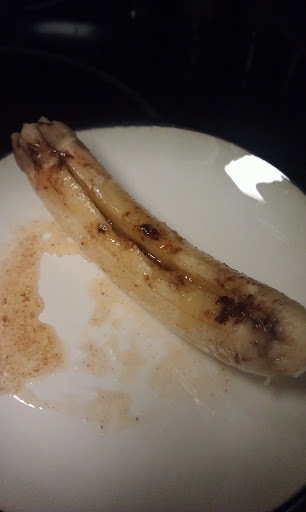 The other night I decided to try something new and came up with this Baked Banana dessert. It’s so sweet, but made with all clean ingredients. 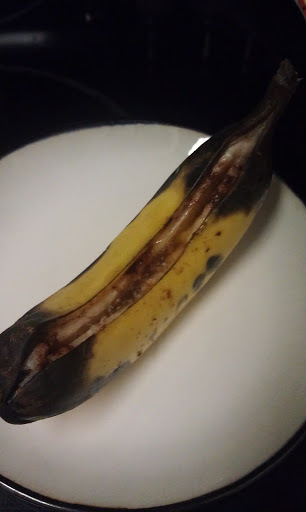 Slice the peel of the banana lengthwise and pull apart so that it is somewhat cradling the banana. Now, slice the banana lengthwise so that it opens up. Place a couple pats of butter and a few dark chocolate chips inside the banana, sprinkle with cinnamon, and drizzle with honey. Wrap in aluminum foil and place in the oven. Bake for 15-20 minutes and remove from the oven. 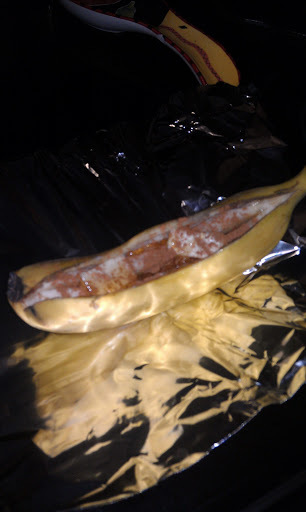 Unwrap foil and remove the banana from the peel. Enjoy!! When you think of sunflower seeds, you may go back to your childhood days of popping them in your mouth, cracking the shell, chewing the kernal and then spitting out the empty shell. Would you ever think that those little snacks, usually consumed in the dug-out or in the stands of a baseball game, would be SO good for you? 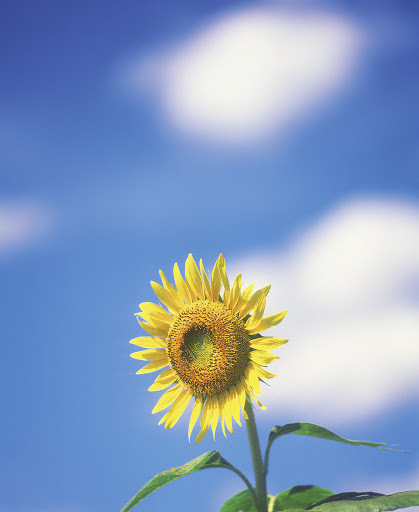 Tiny sunflower seeds contain a world of nutrients. Fiber, Vitamin B1, Vitamin B9, Vitamin E, potassium, manganese, magnesium, iron, selenium, phosphorus and, unsaturated fat (“good fat”) are all found in one little seed. I should note, I’m talking about RAW sunflower seeds, not the ones in the slim packages that are flavored with salt and other fake ingredients. Sunflower seed products are popping up everywhere these days. My favorite product is sunflower seed butter. The common question that most people ask me is why I chose sunflower seed butter over peanut butter. Peanuts are a large genetically modified crop and most of these GMO peanuts show up in commercial peanut butter. Also, commercial peanut butter usually contains large amounts of added sugar. Then the question would arise, “what about organic peanut butter?” It’s a safer bet and I would recommend it if you are stuck on peanut butter. But, why not try something new? 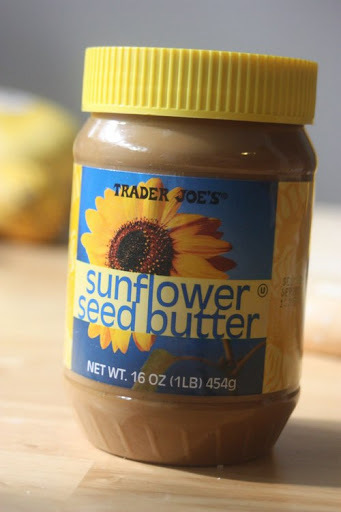 Sunflower seed butter is filled with all of the nutrients listed above and is not a product of a GMO crop. Oh, and don’t forget about nut allergies….sunflower seed butter is a great alternative for those that suffer from nut allergies. You can find sunflower seed butter at your local health food store, even Target is carrying it now. I get mine from EarthFare or Trader Joe’s. 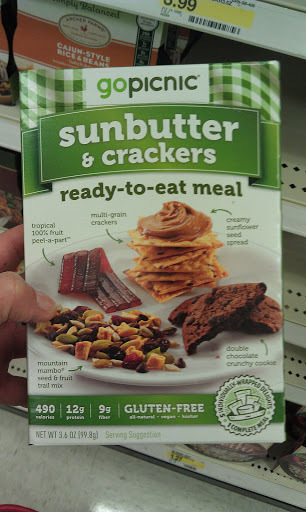 Check out this sunbutter & crackers snack I found at Target for $3.99! It’s a nutritious meal! Another way I love to use sunflower seeds is on top of stir-frys, salads, or in trail-mixes. Sunflower seed butter can be used exactly like peanut butter and used as a replacement for peanut butter in recipes. Stock up on raw sunflower seeds from your local health food store. They usually run about $3-$4 per pound and you can get a LOT of sunflower seeds for that! Earth Day is Monday, so I feel like it’s appropriate to touch on non-toxic cleaners. Going green isn’t just the cool thing to do these days, it’s the only logical way to go when it comes to what you’re cleaning your house with. Having a clean home is a great feeling, but you may not realize that what you cleaned it with may have just made it dirtier. If you have kids, I hope this doesn’t offend you, but it is what it is. You wouldn’t let your kids drink the cleaners under the sink because they are labeled as toxic, so why would you let your baby roll around on the floor that just been cleaned with them or eat off the counter that has been sprayed down with them? So many kids (and adults) suffer from Asthma from an early age. Toxic cleaners/chemicals have been linked to Asthma and other breathing problems and not to mention cancer and other problems with major organs for years now, but still people aren’t switching over? Why? The main excuse I hear…the cost. Medical bills will always trump the couple extra bucks a month. 90% of all poison exposure occur at home. 1 in 13 school aged children have asthma. Asthma rates in children increased more than 160% from 1988-1994. EPA reports that air pollution is up to 5x higher inside than outside. We spend 90% of our time indoors. EPA studies indicate that elevated concentration of household chemicals persist in the air. Long term exposure to chemicals inside our homes is extremely harmful. Children are highly vulnerable to chemical toxins. Pound for pound of body weight, children drink more water, eat more food and breathe more air than adults. This is why children will have substantially heavier exposures than adults to toxins that are present in water, food, and air. The average US home generates more than 20 pounds of household hazardous waste per year (toilet cleaners, tub and tile cleaners, oven cleaners, and bleach). That’s HUGE. Chlorine Bleach is the chemical most frequently involved in household poisonings in the U.S.
Degreasers may contain petroleum distillates, which can damage lung tissues and dissolve fatty tissue around nerve cells. Glass Cleaners may contain ammonia. Ammonia fumes can irritate the skin, eyes, and respiratory system. Oven Cleaners can be among the most dangerous cleaning products and can cause severe damage to eyes, skin, mouth, and throat. Toilet Bowl Cleaners can be extremely dangerous cleaning products and can be harmful if inhaled—and fatal if swallowed. All of this is scary. My husband has respiratory issues and since switching to non-toxic cleaners, he has NOT had one episode. I’ve tried several brands and have found 2 brands that I love. Method and Shaklee. I trust Shaklee more than I trust Method. I know Shaklee is 100% natural, safe, and organic. I’m addicted to the Basic H Super Cleaning Concentrate. It’s around $10 and one bottle equals the cleaning uses of 5, 824 bottles of Windex All-Purpose Cleaner. With the Basic H, I clean my kitchen, bathroom, windows, mirrors, stove, and even my wood and laminate floors. It’s the only green cleaner that I’ve tried that actually works. I also love the Dish Washing Powder. It seriously does a better job than the little pouches that I used to use and is less than $10 for 2lbs and you only use 1 tsp per load. Dr.Oz and Oprah endorse these products and they are also the cleaning products used in the White House. If you’re interested in any of these, you can check them out for yourself at bdickens.myshaklee.com. All products are 100% money back guarantee…no questions asked! Use half the bottle and hate it…send it back….but I promise you’ll love it!